ebm-papst UK is hosting its first seminar in the 2017 energy saving series. The Data Centre Energy Efficiency and Design seminar will take place on 29 March 2017 at the firm’s client centre in Chelmsford, Essex. 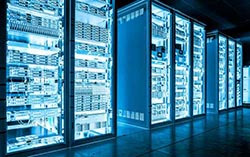 Data centres are a key contributor to CO2 emissions and with the continued demand for increased data processing power and information storage, energy consumption and CO2 emissions resulting from data centres are set to grow. On average, around 50% of all electrical energy consumed in a data centre is a result of cooling, therefore this should be one of the main focuses when looking for efficiency savings, ebm says. As Europe’s largest fan manufacturer, ebm-papst is a leader in the development of energy efficient fans and for many years has worked closely with its customers to enable them to offer the most energy efficient solutions for data centre cooling. At next month’s seminar six key speakers including industry experts, service providers and data centre operators will discuss current trends in data centre design and energy efficiency. Specialist guest speakers will provide the latest news and thinking on energy efficiency for data centres, looking at challenges facing data centre operators. Key ways of increasing these efficiency targets will be addressed through case studies, as well as exploring what the future holds for data centre cooling. A key part of the seminar will examine case studies where successful changes made by different types of data centre operators have delivered significant reductions in the PUE of their facilities. The seminar is aimed at data centre providers, facilities managers, M&E contractors, energy managers, end users, sustainability consultants and others involved in the data centre industry. It will start at 9.30am at the Chelmsford client centre and ends at 13.20pm with a buffet lunch and networking.